No one stood in the way of the Vikings. No one. As they expanded beyond Scandinavia to the rest of Europe and beyond, the Vikings were too organized and too aggressive for anyone unfortunate enough to face them in battle. Fitting then, that the incredible metal tungsten takes its name from the Swedish word for heavy stone, “tung sten.” Like the Vikings, tungsten is unbeatable — it has the highest melting point and the highest tensile strength of any metal on earth. Nothing stands in its way. 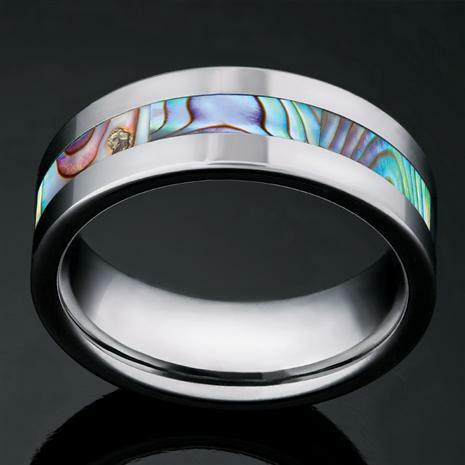 The Men’s Viking Ring is made of genuine tungsten carbide, the toughest metal used in jewelry. It’s set with a stunning central band of natural abalone, displaying an iridescent swirl of intense colors, harvested from the shell of an abalone. Wear this ring to feel the perfect balance of invincibility and inspiration. This classic combination of natural strength and natural wonder is priced at just right. Like tungsten, the price is hard to beat. And should you ever find yourself facing a Viking hoard, one flash of this ring will let them know you’re not to be messed with.